Both "dot" (.) and "dot dot" (..) are links to the same inode information, namely the root directory inode in the root block. The root directory always has entries for the /.bitmap, /.inodes, /.boot, and /.altboot files. These entries are provided so programs that report information on filesystem usage see the entries as normal files. The dinit utility creates this directory with initially enough room for 32 directory entries (4 blocks). The root directory (/) contains directory entries for several special files that always exist in a QNX 4 filesystem. The dinit utility creates these files when the filesystem is first initialized. Figure 1. Contents of the root directory, /. 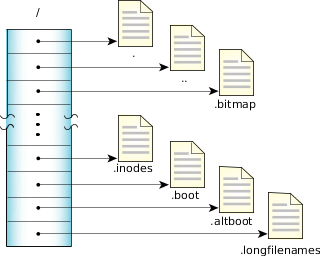 /.bitmap Represents a read-only file that contains a map of all the blocks on the disk, indicating which blocks are used. /.inodes A normal file of at least one block on a floppy/RAM disk and 16 blocks on other disks, /.inodes is a collection of inode entries. The first entry is reserved and used as a signature/info area. The first bytes of the .inode file are set to IamTHE.inodeFILE. /.longfilenames An optional file that stores information about files whose names are longer than 48 characters; see "QNX 4 filesystem" in Working with Filesystems. /.boot Represents an OS image file that will be loaded into memory during the standard boot process. This file will be of zero length if no boot file exists. /.altboot Represents an OS image file that will be loaded into memory during the alternate boot process. This file will be of zero length if no alternate boot file exists.